Charles Rutenberg Realty, Inc. Raises $10,000 in Support of Community Housing Innovations, Inc.
CAPTION: Charles Rutenberg Realty owners Pam and Joe Moshé raise a toast during the Agency's Tenth Anniversary Gala held at Crest Hollow Country Club in support of Community Housing Innovations. Charles Rutenberg Realty recently celebrated its Tenth Anniversary Gala at Crest Hollow Country Club. The celebratory event, which was held to commemorate the company's first decade in business, also honored the Agency's top producing Agents. 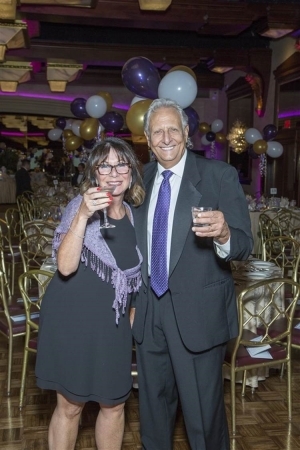 As giving back to the community is of utmost importance to Charles Rutenberg Realty owners Pam and Joe Moshé, tickets to the party were sold as a 100% donation to Community Housing Innovations Inc. (CHI), which resulted in nearly $10,000 being donated to the organization. CHI works to ensure that everyone has an affordable place to live on Long Island and in the Hudson Valley region. The evening featured a presentation from CHI Executive Director Alexander Roberts and a recounting from Fanchon Woodward, a CHI Supportive Housing Client, of the services that the organization has provided to her family. Charles Rutenberg Realty's Gala reflected the culture that Moshés have nurtured since 2006. Top Producers and Ten Year Members were honored, and nearly 400 Agents, staff member and supporting vendors attended. The party was organized as a way for the Moshés to say "thank you" to those who have made the Agency a success. Just ahead of the Agency's celebration of its first decade in business, the company reached its longstanding goal: associating its 1,000th Agent. This summer, Denise Rueda joined the Agency, soon after passing the New York State Real Estate exam, through the encouragement of her mentor, Eileen Collini, who has been a top-producing Associate Broker with Rutenberg since 2009. The Agency presented her with a special honor during the Gala. Guests were also entertained with great food, music, dancing and a video montage with highlights the first ten years in business. CHI provides the housing and human services that enable low- and moderate-income families and individuals to achieve the greatest social and economic independence at the lowest cost to society.